SUNSHINE STATE! 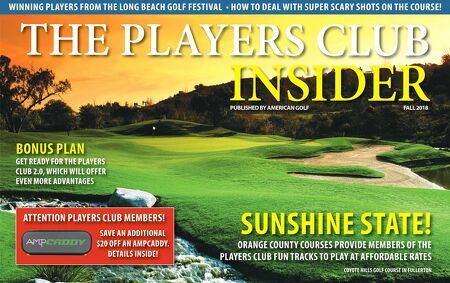 ORANGE COUNT Y COURSES PROVIDE MEMBERS OF THE PLAYERS CLUB FUN TRACKS TO PLAY AT AFFORDABLE RATES BONUS PLAN GET READY FOR THE PLAYERS CLUB 2.0, WHICH WILL OFFER EVEN MORE ADVANTAGES COYOTE HILLS GOLF COURSE IN FULLERTON WINNING PLAYERS FROM THE LONG BEACH GOLF FESTIVAL • HOW TO DEAL WITH SUPER SCARY SHOTS ON THE COURSE! THE PLAYERS CLUB INSIDER FALL 2018 PUBLISHED BY AMERICAN GOLF GET A SPECIAL LIMITED TIME OFFER AND SAVE $60 ON THE AMPCADDY ATTENTION PLAYERS CLUB MEMBERS!